Having hated cauliflower as a child and only recently having started to enjoy it, I have been using it with a vengeance these days. I still do not like it raw, but when it is roasted it has a sweet, almost nutty taste. And it is so easy to roast any vegetable, really. It is a quick, easy way to get your vegetables on the table. I had been roasting it with coriander, cumin, turmeric, and other spices for an Indian flavor. And it has been delicious, but I am always looking to expand my flavor profiles. I still had za'atar on hand from the grilled asparagus I made a few weeks earlier, so I decided to give that a try. 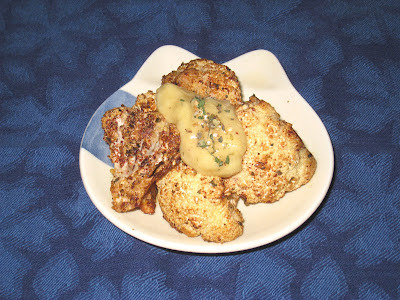 The lemon-garlic sauce gave it an added dimension that was the perfect match for the za'atar. Preheat the oven to 425 deg. F. Line a rimmed baking sheet with parchment paper. Combine the cauliflower florets, garlic cloves and za'atar in a large bowl. Add the za'atar, olive oil, and salt and pepper to taste and stir until everything is well coated. Spread the cauliflower and garlic onto the baking sheet and place in a middle rack in the oven. Bake until just tender, about 20 minutes (start checking after 10 minutes). Remove from the oven. As soon as the garlic is cool enough to handle, squeeze the cloves out from the skins into a small bowl. Add the lemon juice, mustard, and salt and pepper to taste and mash it up into a paste. Add water to reach desired consistency. Serve the cauliflower with a generous dollop of the lemon garlic sauce garnished with more of the za'atar.